Do you have iPads in your classroom? 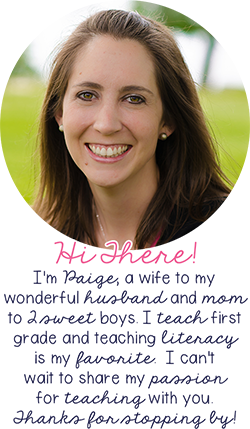 Do you do reading and writing workshop? Then this post is for you! 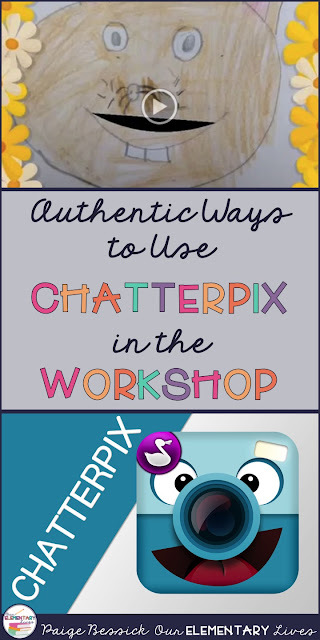 I'm going to show you how I use ChatterPix, a free iPad app, in my workshop. PLUS, you're kids are going to love it! This is the second blog post in the series: Authentic Ways to Use Technology in the Workshop. You can check out the first post >>HERE<<. ChatterPix is an awesome, FREE iPad app. 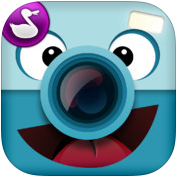 It's by the app makers Duck, Duck Moose, who make some other awesome apps like Moose Math, Word Wagon, Peek-a-Zoo and others. You can check them all out >>HERE<<. Essentially, in ChatterPix, you take a picture, add a mouth and then record so you can make pretty much anything talk. It's funny and the kids LOVE it! When you are in the app, you take a picture of whatever you want. 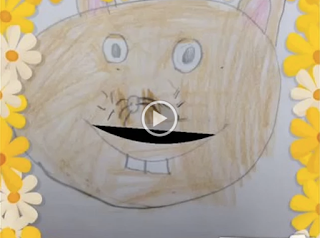 A book, you, a drawing and then add a mouth. You then record what you want to say, and it makes that image talk by moving the mouth that you drew. 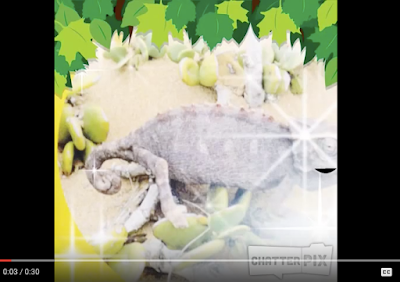 You can then add stickers, borders, and backgrounds which my firsties always love. I'm always looking for ways to celebrate my students' writing. At the end of every unit, we have a celebration of all the hard work we put into our writing. When you can use the iPads to celebrate, it's a win-win for everyone. After we had our nonfiction writing unit and had published our writing pieces, I wanted a fun way for my students to share their work. I am a 1:1 iPad classroom (thank you, Donors Choose) and we use this app, along with others like Sseesaw, PicCollage, Doodle Buddy and others, quite a bit. After a quick explanation and reminder of how to use the app, I let them go. Some students need a small group to complete the project, others can do this completely on their own. I let them decide how they want to share their work using this app and let me tell you, they came up with some pretty incredible ideas. 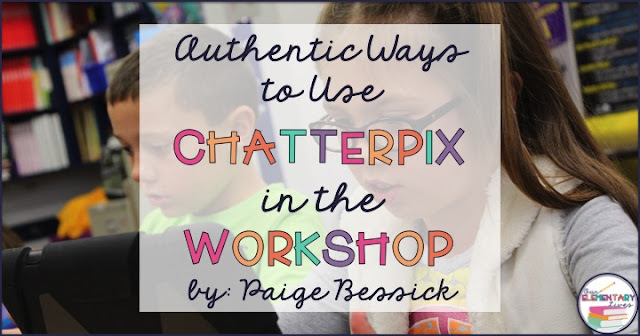 I've also used ChatterPix during our reading workshop as well. 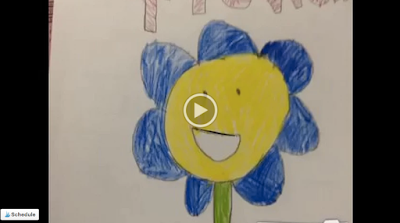 I've had students take a picture of something they have read about and recorded things they learned from reading that book. You could have students retell a book, talk about a character, the problem and solution, the opportunities are endless. Here are a couple tips to help you make this successful. When you do your first couple activities with Chatterpix, go step-by-step. Some students will probably pick up on how to do it pretty quickly, but others won't so to alleviate stress, later on, go through everything slowly one step at a time. Talk about and demonstrate what a good picture looks like. You'll be surprised at what students think is an "acceptable" photo. Be specific about what you want in the background, how close you want it, etc. Allow plenty of time for students to explore and figure out the app. If I've learned one thing about technology in the classroom, it ALWAYS takes longer than planned. I have not figured out a way to make a mouth big or small. If you ever do, please let me know! If your students don't like the mouth, I always suggest starting over and redrawing the mouth. That sometimes gives them a new one. So I hope you LOVE this idea as much as I do. The kids absolutely love it too. If you try it, please let me know and share it with me. You can email me at ourelementarylives@gmail.com. I'd love to see what your kids come up with. Please pin and share if you feel like others will like this. The best thing about a Crazy Critter is that it leaves no mess.